Worldly intelligence is not enough... There is another, rather vital kind of intelligence, which the medieval writers tended to call ‘intellectus’. Intellect, in this sense, refers to our capacity for the intuition of essences. The Intellect is not discursive, linear or mechanical. It makes leaps, it is ‘poetic’. It is the heart thinking: if by ‘heart’ is understood the highest or most central element of the person, or the faculty in which body and soul are gathered to a unity. Intellect perceives the truth directly, rather than inferring or deducing it; and indeed it may never express that truth in words, for the deepest truth of an essence or of a being is not such that it can be fully captured by any verbal proposition. Intellect, then, perceives the truth directly; but normally in our human condition it does not do so without some kind of mediation or support, at least as a ‘trigger’; and this support for intellection is called the symbol. These words were written by our founding editor, Stratford Caldecott, on January 27 2012, in an essay called The Symbolic Vision. They are the literal trigger for our new section: ArteFact. There are many ways of reflecting on the state of human culture in the beginning of the third millennium. Not all of them are discursive, nor do they spring necessarily from those who are ‘onside’ with our concerns. But the arts have always been a crucial lens in man’s search for meaning. As Strat constantly reminded us, beauty cannot be separated from truth and goodness. And yet in a fragmented culture which has lost its sense of spiritual direction, truth will often feel its way towards beauty and goodness through the dark tunnel of ugliness and sin. We have to be sensitive to the deeper instincts being articulated by artists, without necessarily ‘buying into’ what individual artists are consciously or unconsciously attempting to convey. It is a bit like putting your finger on someone’s pulse: you need to know both what ails them, and what full health might look like, if you are going to diagnose correctly. Above all, we need to have that quality of attention that Simone Weil wrote about, if we are to understand where most of our fellow men and women are standing at this time in history. It is this quality which enables us to engage with the world of the imagination: that sphere which all true artists inhabit. Which brings me to the image we have chosen to open the ArteFact section of Humanum. 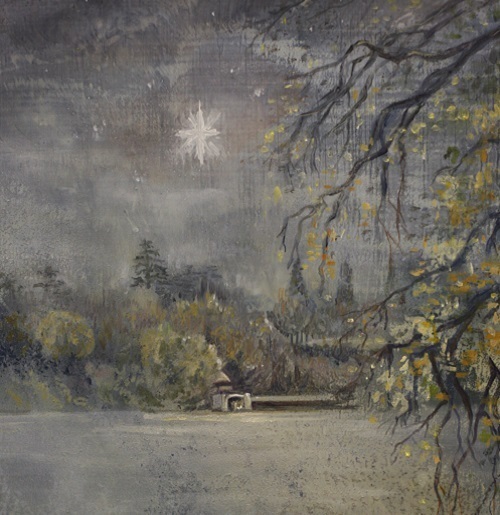 It is a detail of a painting by our youngest daughter Rose-Marie Caldecott (she added the Christmas star just for us!). Rosie, who is currently working on paintings of Capability Brown’s landscaping to be exhibited at Blenheim Palace, inherited her artistic genes from Strat’s grandfather Harry Strat Caldecott, one of the best known South African painters of his generation. Her own practice explores the relationship between the forces of nature and human artifice. And in fact the constant tension between the natural and the human is at the root of all art worthy of the name. The human imagination is fed by nature. Yet we are creatures with inferring minds and opposable thumbs. We frame nature within the human. We make things. We create 'artefacts'. Strat and I always believed in the redeeming power of the imagination. Without imagination, without a sensitivity to the symbolic realm, the spiritual and moral life wither on the vine. “Only by the training of symbolic consciousness can the basis be established for a continued, living interest in the truths of faith and the possibility of spiritual progress.” These words of Strat’s embody the heart of the vision which we shared. I am looking forward to sharing this vision with you. As a preview of things to come, ArteFact is offering our readers a series of Christmas gifts: twelve books and movies which bring the different qualities of human experience to our table. Not all of these are easy to receive. We are, after all, preparing to celebrate the feast which marks God’s incarnation as man, not in a palace or on Mount Olympus, but in a dark cave, a stable fit only for beasts. It seems appropriate, then, to sit down not just with the angels and saints, but also, as St Thérèse of Lisieux had it, at the table of sinners. Breaking bread with the very wretchedness that Christ came to save. And it is this fact, this great eucatastrophe (to use JRR Tolkien’s term), that we celebrate in this holy season. Léonie Caldecott is the UK editor of Humanum.